Conservationists, Katie Dolan, reviews Adam Nicolson’s book The Seabird’s Cry which reveals the threats seabird populations face on a global scale as well as the intricacies of seabird behavior. When visiting an Island Conservation project site, you might think the screaming seabirds are identical “birds of a feather.” Reading The Seabird’s Cry by Adam Nicolson will cause you to reconsider. Chronicling the natural history of ten iconic seabirds, this delightful book highlights individual behaviors and communications between members of a colony. We learn about the lives, loves, and parenting strategies of the seabirds. Avian divorce rates vary from zero among the long-lived Wandering Albatross to five times per year among the guiltless guillemots. Avian cognition specialist Nathan Emery, after examining 480 species, concludes that the more faithful a bird is to its mate, the more likely it is to have a larger brain. He believes monogamous birds need to have relationship intelligence, to be clever enough to understand and predict their partner’s behavior. Seabirds also observe the actions of other birds in the colony. Guanay Cormorants on Peru’s Isla Pescadores signal the location of faraway fishing grounds to the birds sitting on nests by flying straight back to the colony from their fishing journey. As birds prepare to head towards the fishing grounds, they float in a “compass raft” constantly realigned to the flight path of returning cormorants. Guillemots do something similar, creating an “information halo” which points towards good fishing. The guillemot, we learn, is perfectly adapted for its long flights and deep ocean dives, with eyes so large that proportionally, a human eye would be the size of a grapefruit. Not all seabird adaptations are so beautiful or inspiring. Nicolson describes a cycle of violence in certain Nazca Booby colonies, where the distress of low fish stocks translates into higher blood corticosterone levels in both chicks and their parents. This stress leads to fratricide and nest abandonment. The surviving youngsters grow into bullying, marauding teenagers who constantly terrorize the smaller chicks while their parents are fishing. Once begun, this cycle of abuse can become a permanent “socially induced endocrine perturbation” in a colony. Each bird is stressed for its lifetime. In a rapidly changing world, more seabirds may experience stress. Over the last six decades, the world population of seabirds dropped by 70 percent and one-third of seabird species are threatened with Extinction. Seabirds are in more danger than any other vertebrate class due to a combination of overfishing, human development in nesting areas, climate change, ocean acidification, and the introduction of invasive species on remote islands. Seabirds which have evolved on islands without predation by mammalian predators do not have any defenses to protect them from invasive species and are considered evolutionarily naïve. In the Pacific, many birds are unable to smell a rat, so truly have no ability to protect nests from predation. Pollution is also a growing threat for seabirds. With superb olfactory organs, shearwaters can smell the chemical plumes of dimethyl sulphide (DMS) released by schools of krill-eating phytoplankton. The birds follow the odor directly to ocean upwellings and fish concentrations. Sadly, DMS is also released by plastics, which shearwaters mistakenly eat because of the smell. 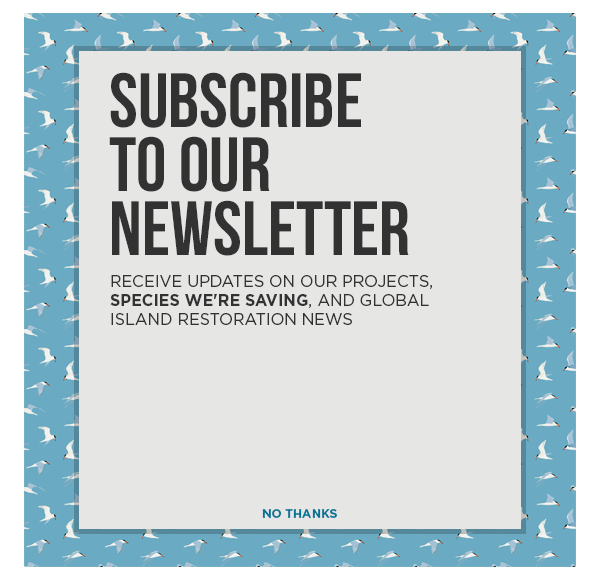 The world’s seabirds can be helped by additional controls on fishing quotas and practices, effective climate change action, and, as Island Conservation supporters know, protecting their breeding places from invasive species. Nicolson concludes his book with a description of a successful invasive rat eradication program in the Shiant Islands. He reverentially watches returning land birds and hopes these remote Scottish Islands will become both a refuge and a gene source for seabirds in other, less protected places. His hope is echoed around the globe at each and every Island Conservation site. Featured photo: Cover of The Seabird’s Cry by Adam Nicolson. Katie Dolan, MBA, MES, and MFA, is an environmental writer who currently serves on the boards of the Wildlife Conservation Society, The Nature Conservancy in Rhode Island, and Tufts Veterinary School. Although she loves her two Newfoundland dogs and other domesticated animals, she fervently believes we must make room for wildlife and heartily supports Island Conservation’s work.